Suitable for all levels of yoga experience, including beginners. There is no better way to experience yoga than by immersing yourself in nature. Let go of your everyday routine and become present under a canopy of tall trees, breathe in the cleanest air in the world and find an all new heightened sense of inner peace and true calm. 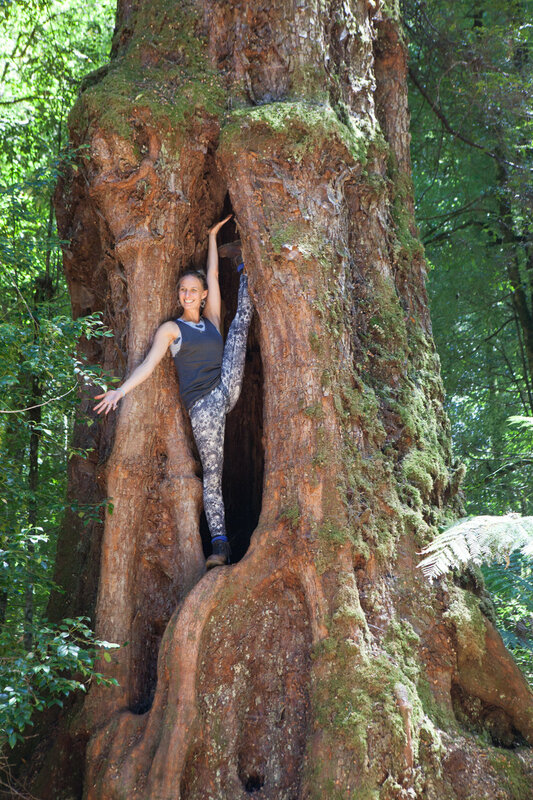 Tarkine Trails have joined forces with Tasmania’s renowned yogini Emma Miley (Founder of Loosen Up and Delicious Yoga Retreats and owner of Yoga from the Heart) to offer you a Tasmanian yoga and wilderness retreat like no other. Emma Miley will guide you through daily yoga, pranayama (breathing) and meditation along with classes of varying yoga styles including aerial yoga, suspended in beautiful load tested hammocks. All levels of skill and experience are welcome and catered for. Our highly trained and experienced wilderness guides will lead you on walks through the takayna/Tarkine, our ancient cool temperate rainforest, sharing their knowledge, warmth and love for this magical part of the planet. Fine vegan food is an essential ingredient to the retreat. Every meal that is served bears testimony to the quality of Tasmanian produce. A place I felt I was so aligned to. A place where I could rediscover my body and its healthy range of movement (quite a difference to the world of dance I grew up in). A place where I didn’t have to perform but instead just explore the feeling sense of the body so intricately, it was this wonderful inquisitive approach that encouraged me to be present and it was this presence that really changed my life. Yoga helped me be the best version of myself I could be, both on and off the mat, and this is what I became so passionate about sharing. It was such an easy and natural progression for me and one I wanted to continue to explore on a deeper level, so it is no wonder my study into yoga has been in a range of styles. Yoga today is so accessible and has many ways to in which to explore it, I am proud to be a part of this shift. In my yoga teacher offerings you can expect a safe, fun and curious practice, weaving yoga philosophy and functional movement. I love learning and sharing my knowledge to help promote, health, wellbeing and presence. I love what I do and because of that I feel better after a day of work and I feel so lucky to be able to say that. 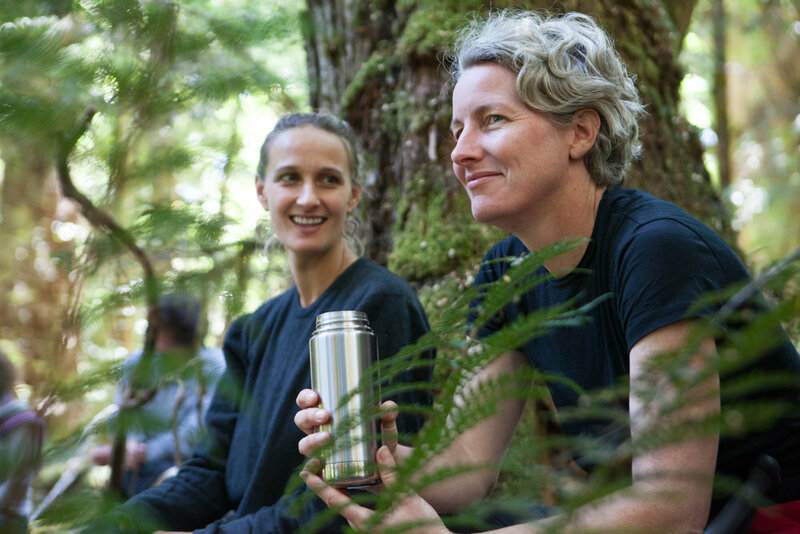 After spending some time amongst the small rainforest stream, it is a short climb to Tiger Ridge base camp, where we will settle in before we open our bodies with a yoga practice to stretch out after a day of travelling before connecting over dinner around the fire. An evening meditation practice after dinner will leave you calm and ready for a great night sleep in the silent starry surrounds. Wake up to the sound of the birds and slowly uncurl like the ferns. Today will start with a gentle morning pranayama (breathing exercises), asana (yoga movement) and meditation practice – and that’s all before breakfast! Following a spot of afternoon tea and debriefing, it’s time to fly! Safely supported in luxurious silk hammocks you will find yourself soaring like a wedge-tailed eagle, hanging like a chocolate wattled bat, and giggling with exhilaration as you discover the exciting art of Aerial Yoga. As the sun and hammocks descend, you’ll relax and unwind over dinner, discourse and perhaps a glass of wine for those who wish to contribute and partake in a night cap. The Huskisson river is a wild river that broadens in the valley floor and, if the water level is low, meanders and warms in pools perfect for a midday swim. We’ll enjoy lunch on the riverbank today and a meditation afterwards to make the most of this truly stunning setting. After making our way back to Tiger Ridge and perhaps a relaxing clean up in the Japanese Onsen, you’ll enjoy a refreshing yoga practice, holding poses for extended periods as we open and relax, ready to settle in for the night with a yoga nidra (guided meditation). It is hard to say goodbye to the takayna/Tarkine. But we aren’t going to even think about doing so until we have enjoyed one last special dose of morning meditation, pranayama and asana, followed by a healthy breakfast and your favourite morning beverage. Take in the incredible rainforest for one last time (for this trip, at least), share your highlights with your companions and prepare for your walk out of the wilderness before we head home.